Proceed with caution ! Talk to Luhrs/Linder about the Arnesons . Thanks for the advice. I already know Luhrs position on the Arnesons, so I wont even go there. Arnesons run at negative shaft angles....so you will need high rake props to offset this shortcoming......and make no mistake....it is a shortcoming. The Miss America Accident I believe was with Kaama drives, not Arnesons..... and the reason that two fatalities occurred was because there was no easy exit built into the canopies and the occupants drowned after a drive ripped off the transom causing a barrel roll. [QUOTE=aex;2683331] Where can I buy the dvd ? I've got George's # should I call him or does Luhrs have a site where he sells them . What power was in the boat at that time, and was that before the canopies? 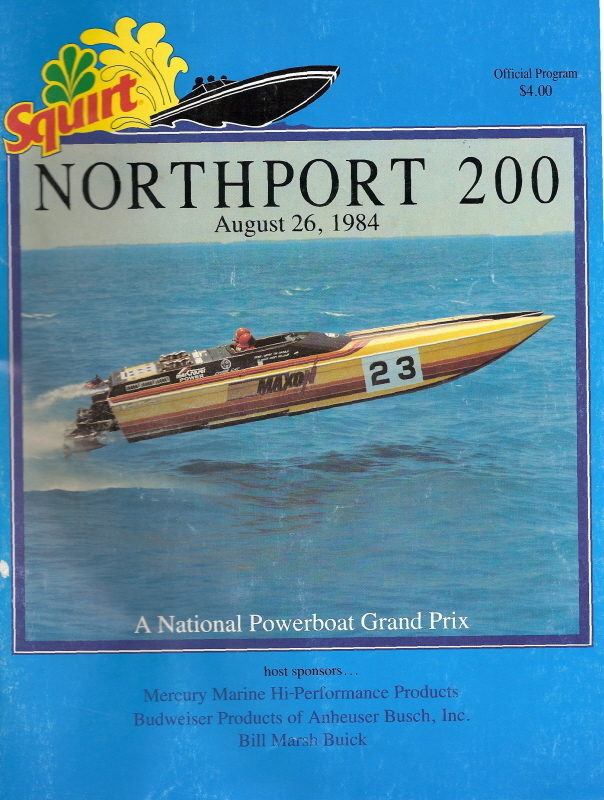 The guys who bought the boat and ran it as Team Eriesistable in the mid 90s had 468s that dynoed at 595 and 605. I believe they had #4s spaced down 3 inches and the best they claimed on the speedo was 98. Just curious. Regarding past vs present speeds I'm pretty sure as they aged the balsa boats absorbed water and this weight gain would surely affect speeds . My boat actually leaked water from small cracks in the step area however it was foam and probably less of an absorbtion issue , but still an issue . The foam must absorb a little I'd guess . Yes, I am sure about the absorption. My take on the lesser speed later was added weight ( canopies etc ) and the fact that 600 horsepower really isn't that much. Also you must remember that there are very different dynos in this world. The Jesse James Chris Cat set an officially timed two way Kilo record at over 108 mph with engines....dyno'ed at Mercury... at about 575 hp each. This boat walked all over many other Chris Cats...with as much as 700 hp...."allegedly" dyno rated. True. To me, a dyno number is just a baseline number to use as a beginning setup tool. The real story is told once the motors are in the boat. It is in the setup of the entire package. Dyno numbers sound good when having cocktails, though. An OSO member , StephenA , is in possesion of the old Finish Line Chris Cat and commencing a restoration . The boat was numbered C-5 out of New Jersey and ran the North East circuit . Steve is looking for some photos of it in its heyday . Steve , I'll bet Jeff at Freeze Frame has some stuff for you . 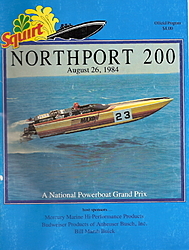 Here is one of the Finish Line & the Maxon Chris Cat from the Northport 200 1984 program. I Was Involved With Team Eriesistible\finishline In The Mid Nineties.stephen H Was Correct We Had Roughly 600 Hp The Boat Would Do 88-92 Tops. Heavy Boat But It Ran Good In The Rough Water. John M.
It probably isn't the old Smokey. I just don't remember any other all red Chris Cats. But then again, it's been a long time, and my memory gets worse as I get older. Kurt is that you ? How's Ozzie ? I remember him as a baby . Ricky "Racer" Conti and Bob Catanzaro bought your red Chris and named it Double Vision 2 . I called Rick he told me the boat had radical small blocks . He added they were running really well in Key West , hanging with open boats until an electrical short put them out and some time later sold it to Peter Pacovik from Fla.
All the boats from your stable ran well and thanks again for always lending a hand or doling out advice . On a sad note Ricky Racer towed Spirit of Miss Liberty back to Ft Lauderdale after the crash . A trim cylinder mounted to the transom where a hole had been plugged caused the failure . It did have Kaamas . He told me every time he looked in the rear view mirror he got sick . Returning the truck and boat to the family must have really been hard . He also added cockpit access was tough on the boat as T2x had indicated earlier . He said they scrambled to make the race and it sounded like the cockpit may have been a work in progress . Hi John. Hope all is well with you! Say hi to Gary and Walt when you see them!